Thomas Pelham-Holles, 1st Duke of Newcastle-under-Lyne (1693-1768), Prime Minister. Sitter in 17 portraits. 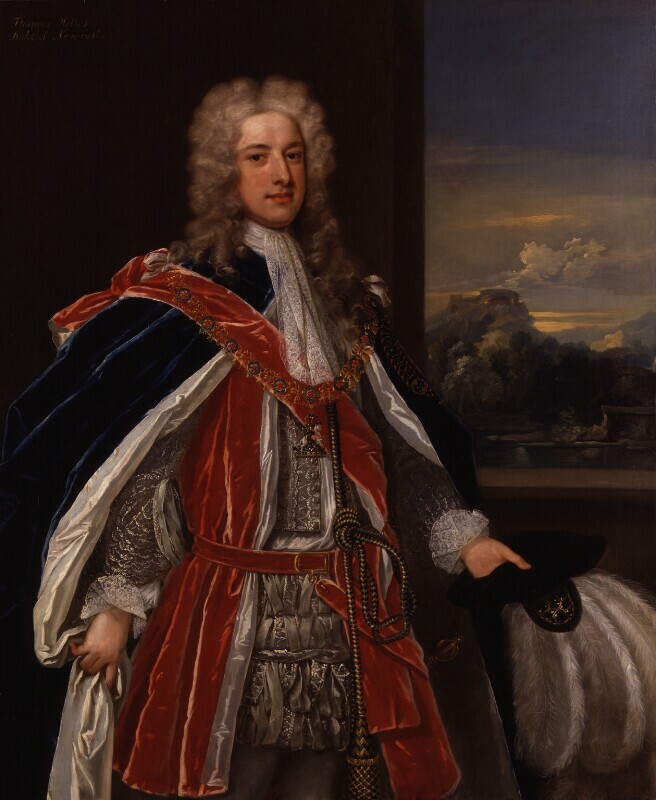 Robert Walpole becomes the first British Prime Minister and holds the post for an unrivalled tenure of twenty-one years. Former Chancellor of the Exchequer John Aislabie is imprisoned in the Tower of London and found guilty of corruption for his part in the collapse of the South Sea Company. Artist William Hogarth produces his first satirical engraving The South Sea Scheme in response to the South Sea Bubble of the previous year. Writer and diplomat's wife, Lady Mary Wortley Montagu introduces the smallpox inoculation to Britain. The Princess of Wales is persuaded to test the treatment and the procedure becomes fashionable. Johann Sebastian Bach writes the six Brandenburg Concertos for his employer at the court of Köthen. Montesquieu completes his best-selling Lettres Persanes (Persian Letters); a critical view of contemporary western politics, religion and society. Treaty of Nystad in which Sweden cedes Estonia to Russia with most of Latvia. Russia becomes the dominant regional power and Peter the Great has himself proclaimed 'Emperor of all Russia'.